I wanted a forced perspective shot, something that would distort the apparent size and scale of these buildings, and the only way to effectively capture this was to hoist myself onto the ledge of an open window, then lean out over the street while seated on the ledge. As I was framing the shot, I saw two people walking down the sidewalk on the other side of Mason Street and I was able to put them in the very corner of the frame. I am still influenced by images from my past, it would seem; in this case, the silent film Metropolis by Fritz Lang, although I did not have that in mind when I was taking this picture. THE ARROW – 18 6TH ST. This is the interior of a 6th Street bar once named The Charleston, now known as The Arrow. Not long before I captured this image, The Charleston was a neighborhood bar, a place to socialize for the people who live in this area's hotels. The proprietors sold their liquor license to some young entrepreneurs, and the owners of other bars on 6th Street soon followed suit. In the space of about a year, all of the bars on 6th Street had closed, then re-opened with new names, catering to a very different clientele. My friend Jim, who has lived on 6th Street for many years, helped the new owners of Arrow get started. For a while, he worked the opening shift each night and I used to drop in for a pint now and then while he was working. One of those times, I took some photographs of the bar. This one is my favorite. "Transfiguration" is not a word that I bandy about or use lightly. Here it refers not only to the distortion that resulted from my perspective, but also to how the pink light of early morning changed the appearance of the building. It became something more than just a grubby, little, back-alley facade in the light of dawn that morning. I couldn't tear myself away from it until the sun finally rose high enough to vanquish that magical, pink light. MIDTOWN LOANS & WHITAKER HOTEL – 39 & 41 6TH ST. The history of 6th Street is rich and colorful. It is also almost entirely overlooked, because for most people 6th Street is synonymous with skid row. Many of the people who have lived on 6th Street played a role in the shaping of San Francisco. When I first came to the City in 1968 to enroll at the Art Institute, the hotels that line 6th Street were largely populated by merchant marines and retired blue-collar workers eking out their “golden years” on meager pensions. These men were wrongly labeled as bums and winos because they lived alone in aging residential hotels in a district that was officially classified as blighted. The fostering of such stereotypes by the redevelopment agency and downtown developers was, unfortunately, highly successful. These associations carry over from the past to color the way we now see the area and the people who live there. EL FOREST – 1255 POLK ST.
For more than a hundred years property owners and managers have used presentation photos to show off their buildings and attract tenants. Some of the oldest of these photographs are sepia tone. The buildings they show often have a monolithic quality about them because at the time of their construction there were few, if any, neighboring buildings to block the view. This grand, old building still has that monolithic quality and it was built at a time when sepia tones were popular. Although I photographed the El Forest in color, I tried to impart to it the look and feel of an old sepia tone — my homage to the presentation photos of an earlier day. K & H HOTEL – 395 EDDY ST.
(formerly Lando Hotel; later Troy Hotel, Hotel LeBurt, Lester Hotel, Hotel St. George) 1906. Architects: Rousseau & Sons. 3 stories, brick facade, arcaded top story, some brick base infill. The striking building that dominates this picture is the one-time Hotel St. George, located at the intersection of Eddy and Leavenworth Streets. The St. George has unfortunately been re-named the K & H Hotel, a truly awful name for this little architectural gem. At least the current owners were able to give their hotel a nice paint job. I really do like the colors. I’m grateful they left the old sign up; it prevents the new name from feeling too “official”. HOTEL KINNEY – 410 EDDY ST., HOTEL VERONA – 317 LEAVENWORTH ST., CADILLAC HOTEL – 380 EDDY ST.
Caddy corner to the Hotel St. George is the Hotel Verona, which is next to the Hotel Kinney and across Leavenworth from the Cadillac Hotel, a very small part of which can be seen in the background. The Hotel Verona is a cut-rate tourist hotel and is a fairly large building but not once have I ever seen anyone entering or leaving. Nor have I ever seen more than two or three rooms with lights on at night. I don't know how the owners manage to stay in business. 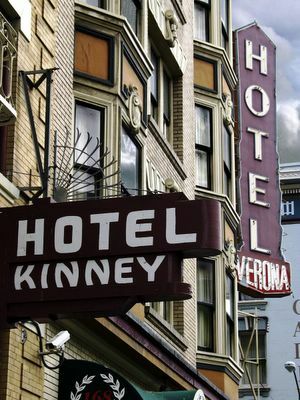 The Hotel Kinney was closed in 1999, after a fire burned out several rooms. Instead of having the building repaired, the owners kept it boarded up. At one point the windows were un-boarded, raising hopes that the hotel would at last be repaired. Unfortunately, all activity stopped with the un-boarding of the windows, leaving the Kinney as a home for just the spiders and the mice. 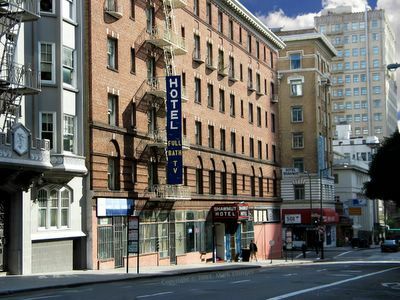 HOTEL JEFFERSON – 440 EDDY ST. Whenever I walk down this stretch of Eddy Street, I enjoy the patchwork quilt of overlapping signs and fire escapes that recede into the distance. It is a tribute of a sort to the cosmopolitan character of the Tenderloin. 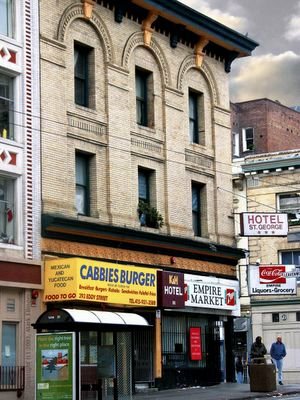 People from all walks of life and from many different countries are everywhere you look, making the Tenderloin one of San Francisco’s most diverse neighborhoods. I take special delight in rooftop views. From such a vantage point, the world below becomes a separate reality, as it always does when one is looking down from on high. The rooftops in this particular picture are, in a way, even further removed from "reality", because distance has been compressed by a telephoto lens. 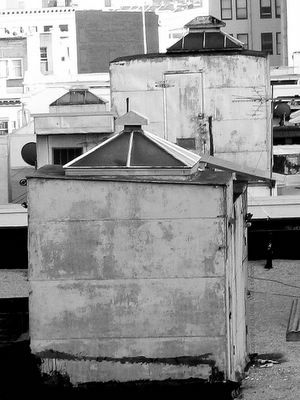 The little cube-like structures with vented skylights are rooftop exits for stairwells, and most of the older apartment buildings and hotels in San Francisco have them. I was seeing them more as abstract shapes on the day I took this photograph — a pattern of rectangles, cubes and pyramids. COLUMBIA HOTEL – 411 O’FARRELL ST.
1909. Architects: Sutton & Weeks. 6 stories, painted brick facade, Mansard roof, base much altered. 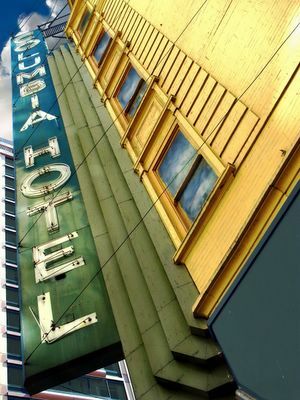 The Columbia Hotel is on the corner of O'Farrell and Taylor Streets, ½ block from the Winton. 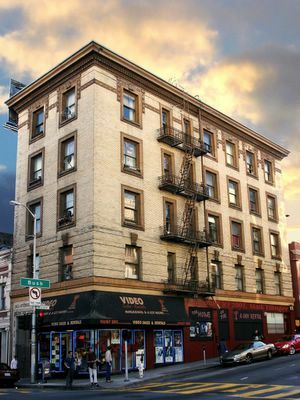 It is a six-story structure with brick walls and a mansard roof. Before the bricks were painted yellow, the Columbia was probably a handsome building. Now it is an unusual building, to say the least. The neon sign for the hotel, now broken, is something of an oddity too. Except for its color, the hotel looks like something the Addam's Family might live in, while the sign is a '20s Deco design painted in shades of green. The sign is five stories tall and must weigh several tons, being constructed entirely of metal. The Aldrich is just down the hill from the Garland Hotel, between Ellis and O'Farrell Streets. 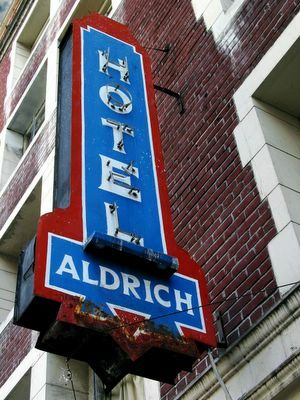 You can see the exterior of the Aldrich in its entirety in Summer Evening - The Tenderloin. 1909. Architects: Sutton & Weeks. 5 stories, painted brick facade, Mansard roof, base much altered. 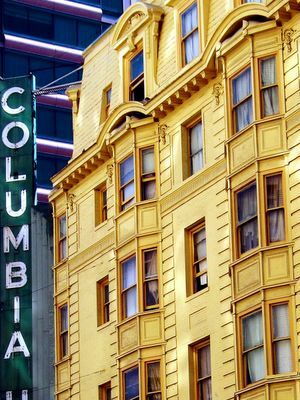 I have included this shot of the Columbia to show both the mansard roof – an uncommon sight in San Francisco – and the unmitigated, overwhelming yellow of the façade. The Marathon fascinates me for its unique details and as a study in decay, compelling me to return to it repeatedly. With each new visit, my eye is attracted to something I hadn't noticed before. This time it was the pilaster that seems to support the stringcourse where it ends behind the entablature. 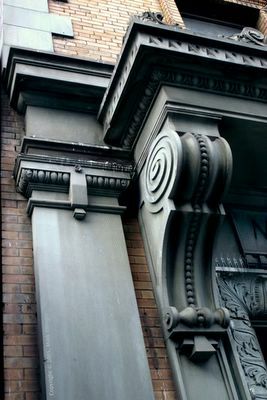 The capital is carved to look like a fringed belt with a single tassel that hangs down over the pilaster. At the very top of the tassel is a tiny, delicate flower that in all likelihood has gone completely unnoticed and unappreciated for many long years. SHAWMUT HOTEL – 516 O’FARRELL ST.
One facet of urban architectural photography that makes it so engaging is how critical the time of day can be to the making of successful images. The shadows cast by tall buildings create a game of hide-and-seek with one's subject matter, and in San Francisco the often cloudy sky is a factor as well. I captured this image of the Shawmut Hotel one morning about an hour after sunrise. Visible in the shadows behind the Shawmut, on the other side of Jones Street, is part of the Pacific Bay Inn. 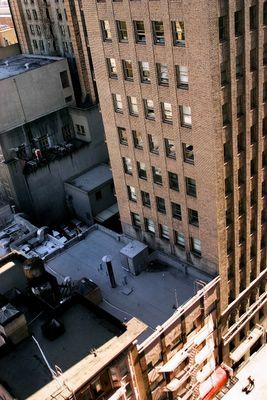 Looking northeast from Minna Alley near its intersection with Mary, one sees the old Chronicle Hotel on the left and the Chronicle Newspaper Building on the right. 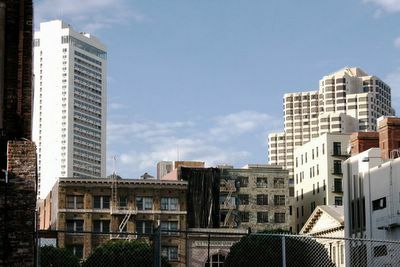 Behind the Chronicle Hotel, from left to right, are the San Francisco Hilton Tower, the then-unfinished offices of the Martin Building Company, the old fire station that is the subject of Peeling Wall and the Parc Renaissance 55 Hotel. Also seen to the right are the pediment and red brick chimneys of the Old Mint. 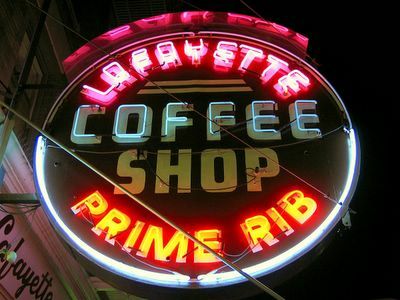 Though in need of repair, the Lafayette Coffee Shop's neon sign barely shows its age. The sign is easily fifty years old and the paint and neon tubing is entirely the original article, a testament to the craftsmanship of its makers.